Average Height	: 23" - 26"
Average Weight	: 50- 70 lbs. In the late 18th century, Germany's interest in bird dogs brought countless Huehnerhunde (meaning chicken dog) into the hands of hunters. The Large Munsterlander, also known as the Grosser Munsterlander Vorstehhund, although a German bird dog, has not been around quite that long. It evolved in Munster, Germany. 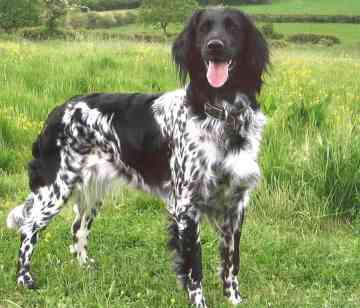 The Large Munsterlander is one of several continental breeds of versatile hunting dogs. Although the breed is one of the last of the German breeds to gain official representation by a separate breed club, the Large Munsterlander was recognised as a colour variant of the German Longhaired Pointer prior to that time. The breed first gained official recognition in the Munsterland of northwestern Germany in the early 1900s. However, the forerunner of the modern Large Munsterlander can be recognised in artist's representations of hunting scenes as far back as the Middle Ages. The Large Munsterlander was introduced to North America by Kurt von Kleist in 1966. A multi-purpose gundog, ideal for the rough shooter. This is a dog with an excellent nose, staying power and works well on land and in the water. Munsterlanders are keen workers and easy to train. This field dog characteristically is calm, gentle with children and well adjusted to living in the master's dwelling. The versatile characteristics of the breed provide for a reliable companion for all facets of hunting. A recent comparison of the scores of 82 Large Munsterlanders with 104 other versatile breeds entered in North American Versatile Hunting Dog Association (NAVHDA) tests showed that the Large Munsterlander is a versatile dog with a difference. On average, Large Munsterlanders work closer and are more responsive to the handler than other breeds although the Large Munsterlander's pointing instinct matures later. The breed displayed greater cooperation than other breeds and an excellent concentration in the tracking and recovery of crippled game birds. During search for game, most dogs range 50 to 150 yards (46 to 137 m), depending on cover. Their long and thick coat protects them against cold and allows them to search dense cover thoroughly, but as a result leaves them more susceptible to burrs.